With Manga Entertainment about to unleash the second season and OVAs of Negima!, I thought it might be a good time to check out some of the merchandise available! 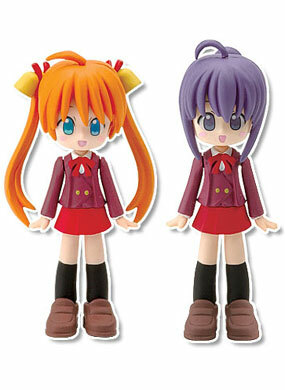 These figures were originally released back in 2005 and consists of five characters from the immense Negima! cast - Asuna, Konoka, Nodoka, Makie and Fei. Each figure is approx. 7cm (2.5") tall, and comes ready painted and assembled. cutesy look all the characters are instantly recognisable from the anime and manga, which is surprising as the design of each one is pretty much identical. The body, pose and outfit are identical on every figure (with the exception of Fei's socks and shoes), and the only variation is on the characters' heads and hair. The facial expressions are generally quite similar as well, and there is limited poseability. However, the figures are well detailed and colourful, and considering the whole class will presumably be available eventually, there's a real collectability factor to them too. the figures, they may have different hair but the design and pose of the rest of the body is pretty much identical. The only variation is on the sixth 'hidden' figure, which is just Asuna in casual clothes. 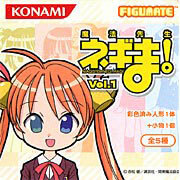 These figures are cute, and they do look like the characters they represent. However, the lack of a stand or way to attach the accessories to the characters is a real shame. The figures aren't very varied but do look good when you have a few lined up, and they are bright and cheerful too. If the technical issues are resolved these would be getting a higher score, but as they are they are decent but unremarkable. Each figure comes with an accessory that is themed to each character. Asuna has a paper fan, Konoka has Chamo the Ermine, Nodoka has a book, Makie has gymnastic clubs and Fei has her school bag. As mentioned they can't be attached to the figures, which makes them a nice - but ultimately pointless - extra.